Of all the days for Blogger to go down (that's what she said), why did it have to be today? This morning, I was chomping at the bit to share some exciting news and Bloggers was MIA! My preshus, smartie-pants hubby has made me all kinds of proud today! Check out the video below for a comparison of his iOS app, Downcast (my sole sponsor on the right), versus one of his competitors. To see the full comparison start at 38:36, but if you want to skip to the goods go to 42:46. Now, for those of you that don't know (probably ALL of you because I hardly know) the man in the video is Leo Laporte and is the mind behind Twit and all its podcasts and stuff that my husband enjoys nerding up on in his spare time. My hubby's app has been available in the app store for several months and he's done pretty well for an app with hardly any "press." He's been selling anywhere from 15-30 apps per day which brings in a handy chunk of extra change each month. So imagine my surprise when he comes into the bathroom this morning while I was still in the shower (this never happens) and tells me he sold a whopping 110 Downcasts yesterday. I believe I responded, "Shut up. You did not." because we like to exaggerate for no reason sometimes. But lo, he was actually NOT kidding. I kinda freaked, but did so quietly. He proceeds to tell me that some dood named @psxmac apparently tweeted to Sarah Lane (the lovely young lady who is actually comparing the apps in the video) that she should check out Downcast in addition to the "other" podcast app she was reviewing. Hence, the segment. 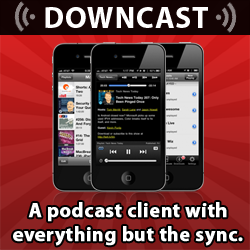 And Downcast won. We are in love with @psxmac and Sarah Lane. very nice! tell him to write one for android before someone else does. I'll buy it! So I didn't understand a lot of what she was saying, not being a smart phone folk, but she was really talking up the Downcast! Woot woot!